In East London the clean-up has begun and preparations for the Paralympics are well underway. But just in case there is an Olympic-sized void in your life post London 2012, the Robo World Cup kicks off in Bristol next week, with teams from Bristol and Plymouth Universities competing. The first time the Robo World Cup has ever been held in the UK, the competition features robots competing in events such as football, basketball and weightlifting. More than 200 participants from 27 different countries, as far flung as Mexico, India, China and Taiwan are coming to Bristol, armed and ready to pit their mechanised automatons against each. It’s the future of the Olympics now, with robots. If this sounds devastatingly exciting, it’s because I’m overselling it. Generously put, it’s like a geek Olympics, the robots are small, move slowly and most of them don’t even look like what most people call a robot. The highlight tends to be the “HuroCup”, where the robots are humanoid shape, up to 130cm tall and can weigh up to 30kg. 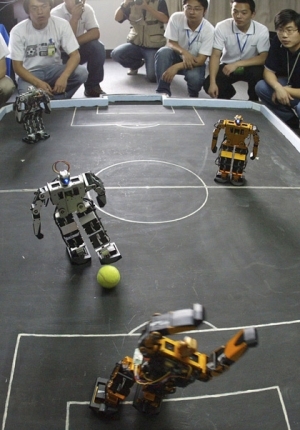 Other categories such as the “MiroSot” feature wheeled robots in five or 11-a-side games of football. Cameras track the position of the robots and the ball, relaying this information to a computer that calculates the next move. So it’s not exactly Optimus Prime vs Megatron in the 100m sprint at the Olympic stadium. Even so, the Robo World Cup is a well-established spectator event in its own right. Founded in 1996, the organisers promise a “specatacle in its own right” with opportunities to “marvel at pioneering mechanical, electronic advanced artificial intelligence in action”. Team GB is represented by Bristol University and the University of Plymouth, the event is free to attend between the 22nd and 25th of August (Wednesday to Saturday) in the awkwardly named At-Bristol. Whatever you do though, don’t confuse the Robo WorldCup with its slightly flashier rival competition Robocup. Which was in Mexico earlier this year and had bigger robots. Previous articleIs it a bird? Is it a plane? Or is it the quieter, more efficient aircraft of the future?